L’Amour Junk~ detailed with elegance for the two of you. L’Amour Junk is designed in the style of the traditional sailing boats. It is the first small deluxe one-cabin junk in Halong Bay, promise to be an ideal option for a couple doing romantic honeymoon trip, wedding anniversary or dear friends travelling together. L’Amour Junk is perfect for both a romantic getaway, and for honeymooners. Day trip cruise is a short journey created to give you a short observation of the breathtaking scenery of Halong Bay. The day cruises can be classified as the haft-day cruise and full-day cruise. 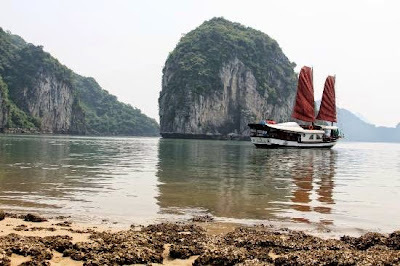 While attending day cruises allows you to travel from Hanoi to Halong and back within a day where your time is limited; otherwise, we strongly recommend you to book an overnight cruise.